In late-day light, Kaleetan Peak (left) and Mount Roosevelt (center and right) form a dramatic backdrop for Gem Lake’s looking glass. Gem Lake, High Lakes Trail, September 02, 2011. Continuing beyond the ever popular Snow Lake, the High Lakes Trail affords access to additional lakes higher and deeper within the Alpine Lakes Wilderness. 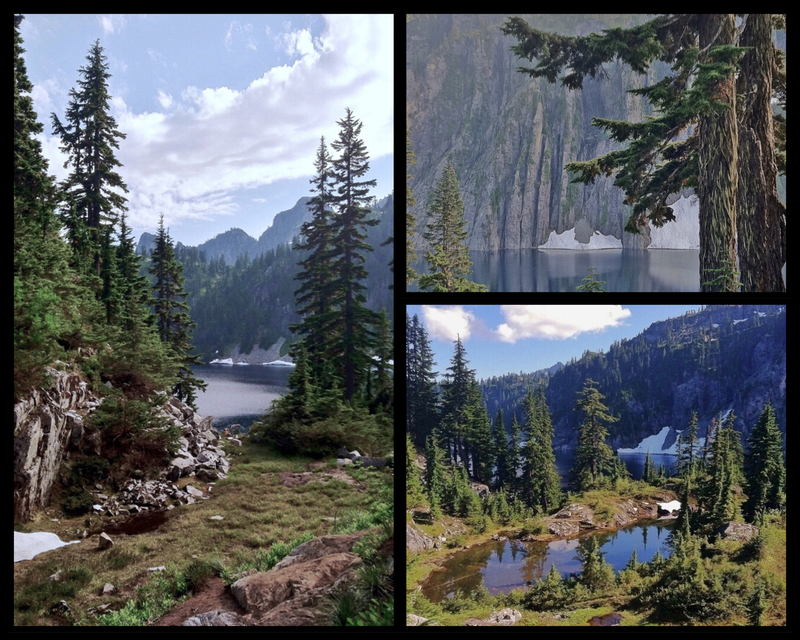 Gem Lake is a relatively easy — although ruggedly steep — 2.00 miles/3.20 km beyond Snow Lake. Zigzagging upward, the trail provides additional, forest-fringed glimpses of Snow Lake‘s cliff-walled waters before cresting the ridge on its west end and arriving at the shore of Gem Lake. Unassuming at first, the view of Gem Lake only improves as the trail rounds its edge and faces the many spires of Kaleetan Peak and Mount Roosevelt, often reflected perfectly on its placid waters. Continue farther for a bit of backcountry solitude where few others venture. Beyond Gem Lake, the trail descends Wright Mountain’s western flank from near its very summit to near its very foot, dipping beneath Mount Roosevelt’s gabled peaks on the opposite side of the narrow valley cleft between them and passing a few verdant ponds before reaching Lower Wildcat Lake. From Lower Wildcat Lake, the trail again climbs steeply an approximate half mile/0.80 km to the upper lake. Between the Lower and Upper Wildcat Lakes, the little-maintained trail remains mostly visible beneath overgrown foliage, but route-finding aids may be advisable. Distance and rigor combine to render the High Lakes Trail challenging as an end-to-end day hike, given the massive elevation gains and losses in each direction — approximately 3,500 feet/1,066 meters from the Snow Lake trailhead and back. Be sure to allow plenty of daylight to complete the hike or plan to camp at one of the few campsites along the lakes. This profile begins at the High Lakes Trail’s junction with the Snow Lake and Rock Creek trails on Snow Lake‘s northeast end. 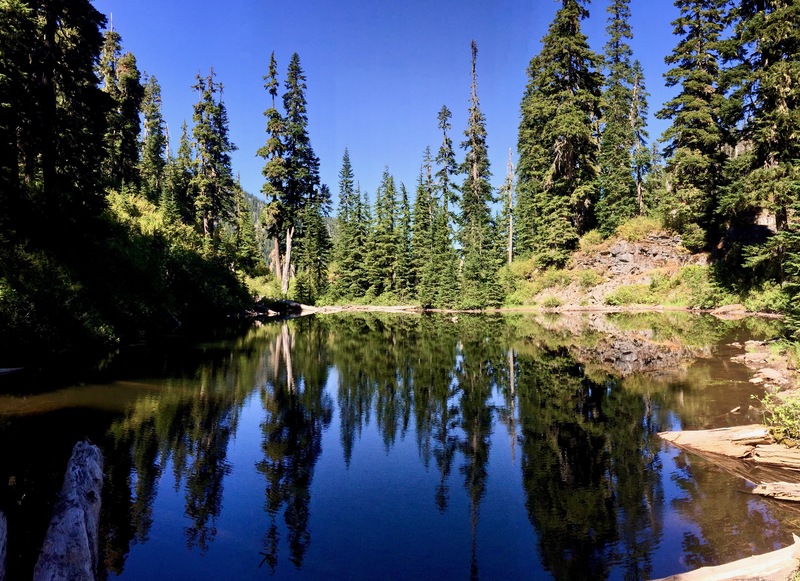 From its junction with the Snow Lake and Rock Creek trails, the High Lakes Trail continues around Snow Lake, providing glimpses of Chair Peak’s deeply fissured face across its waters as it climbs amid tarns and old-growth forest. 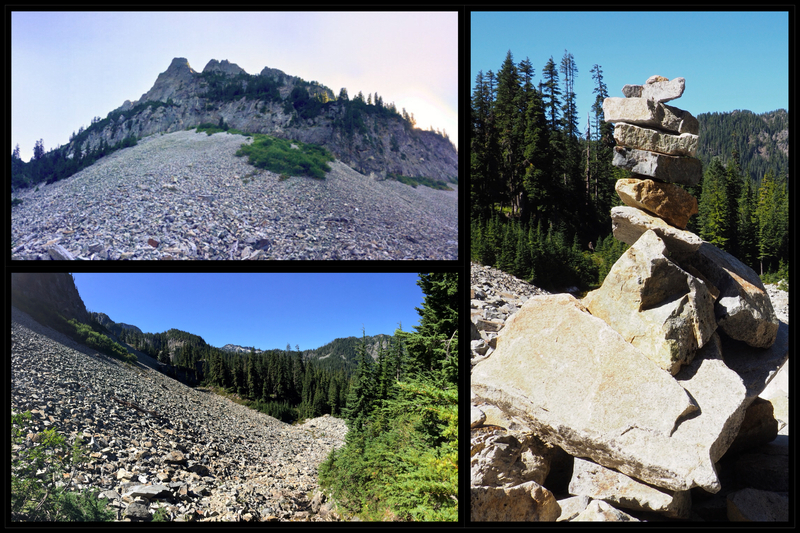 Snow Lake, High Lakes Trail, September 02, 2011 and August 19, 2012. Here and there, distant Cascade peaks can be spied rising beyond the Middle Fork Snoqualmie River Valley; here, from left to right, Overcoat Peak, Chimney Rock, and Lemah Mountain. High Lakes Trail, September 02, 2017. During the brief mountain summer, drifts of partridgefoot (Luetkea pectinata) and pink mountain-heath (Phyllodoce empetriformis) gladden the upland trailside. High Lakes Trail, August 17, 2014. Ascending by many meandering switchbacks, the trail finally reaches Gem Lake’s jewel-like waters pooled just atop the ridge that bounds Snow Lake’s west end. Wright Mountain rises beyond. If at first sight, the view seems less than stunning, continue — it only improves as the trail rounds the lake. Gem Lake, High Lakes Trail, September 02, 2017. Gem Lake’s glassy waters often fashion abstract images from the surrounding peaks. Here, Kaleetan Peak (left) and Mount Roosevelt (center and right) mirror themselves in evening’s lingering light. Gem Lake, High Lakes Trail, August 19, 2012. On Gem Lake’s surface, Chair Peak appears to bridge a dusky sky above the treetops. Gem Lake, High Lakes Trail, August 19, 2012. Beyond Gem Lake, the trail approaches Wright Mountain from the ridge just below its summit (here, on the right), and switchbacks to the valley floor below, rapidly losing approximately 1,000 feet/305 meters in elevation — which is regained on the return trip. High Lakes Trail, September 02, 2017. Descending Wright Mountain beneath the very eaves of Mount Roosevelt, the trail traverses the length of a massive talus field, where it can be difficult to discern among the jumbled stones. Look for cairns built by other hikers to guide the way. High Lakes Trail, September 02, 2017. Shortly before reaching Lower Wildcat Lake, the trail passes several quiet ponds tucked into the shadowy valley woodland. High Lakes Trail, September 02, 2017. The trail arrives abruptly at the shore of Lower Wildcat Lake, wreathed by dense forest. From the small campsite on the lakeshore, the trail continues left (when facing the lake) across a small creek. It is overgrown and can be difficult to locate, but, once found, is generally easy to follow beneath the overhanging foliage. However, route-finding aids may be helpful at this point. High Lakes Trail, September 02, 2017. The trail climbs steeply for the last half mile/0.80 km to Upper Wildcat Lake, which lies in a rugged stone basin set beneath Caroline Peak’s flat-topped summit. Upper Wildcat Lake, High Lakes Trail, September 02, 2017.